Leather industry is in fourth position in term of exporting leather and leather product of Bangladesh and one of the most growing industry of Bangladesh. So demand for meritorious and creative leather Engineer is increasing day by day. Leather engineering is a profession that deals with the application of scientific, engineering and technological principles to the design and control of all aspects of leather processing, leather materials, leather chemistry, leather products design, manufacturing system and machinery. Besides these departmental subject basic electrical engineering, computer fundamental and programming , computer aided graphics design, basic mechanical engineering subjects are also taught in 4 years Leather engineering Curse . As leather industry, in Bangladesh, is growing rapidly, the demand of talented and creative leather engineer is rising as well. There are not many leather Engineers available in Bangladesh. So our country has to hire Leather Engineer from other countries every year. Bangladesh Leather Engineering and technology faculty of Dhaka Universityhas 3 departments. They are – Leather Engineering, Footwear Engineering and Leather Product Engineering. It has all the modern facilities to provide leather engineering theoretically and practically. Only lacking is its limited seat facility. 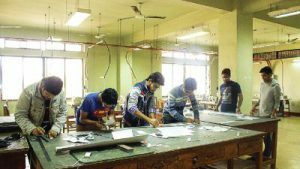 Only 120 students get the chance of getting admitted in Bangladesh Leather Engineering and Technology faculty of DU. But it is a message of hope that it has plan to increase its seat facility to a large number in near future. KUET has 60 seats for Leather Engineering course.